Transcript of a report on National Public Radio. You can listen to the story here. MATT MARTINEZ: Great, great, great. I’m very excited. The number-one-most-e-mailed story at npr.org is headlined: Old-fashioned play builds serious skills, with an S not a Z, unfortunately. It’s by NPR science reporter Alix Spiegel, and it basically traces how childhood has been changing, and she starts with an episode of “The Mickey Mouse Club.” She says that’s a turning-point of sorts. In 1955, it basically changed the way that children would be spending their time, and some experts say the shift has altered children’s imaginations, the way that the minds develop. So here she is explaining what happened that day. It was during the first episode of “The Mickey Mouse Club” that the Mattel Toy Company introduced a new product, a toy gun that the company claimed had almost magical properties. Unidentified Announcer: It’s broken the sound barrier. It’s the Mattel Thunder Burp with a real, vibro-sonic sound chamber that’s loaded forever and ever. No batteries, no caps. That Thunder Burp looks like real, sounds like real. SPIEGEL: Historian Howard Chudacoff says that until that October afternoon, no toy company had ever tried to sell merchandise on television year-round. The only time toy manufacturers advertised on TV was during Christmas. But then came Mattel and the burp gun, and according to Chudacoff, a professor at Brown University who recently wrote a history of child’s play, almost overnight, children’s play became focused as never before on the toy itself. Professor HOWARD CHUDACOFF (Cultural Historian, Brown University): It’s interesting to me that when we talk about play today, the first thing that comes to mind are toys, whereas when I would think of play in the 19th century, I would think of activity rather than an object. SPIEGEL: You see for most of human history, what children did when children played was engage in free-wheeling, imaginative play, elaborate narratives of pirates and princesses. Basically, they spent most of their time doing what looked like nothing much at all. Prof. CHUDACOFF: They improvised play, whether it was in the outdoors, the fields and the forests, or whether it was on a street-corner or somebody’s backyard. They improvised their own play. They regulated their play. They made up their own rules. SPIEGEL: But Chudacoff argues once TV and toys began to supply children with ever-more-specific scripts and special props for their stories, the size of children’s imaginative space begins to shrink, and that’s not the only way that imagination comes under siege, according to Chudacoff. In the second half of the 20th century, he says, parents were increasingly concerned about safety, which again affected play. Prof. CHUDACOFF: Because then adults wanted to structure it more, to create environments that are safe, that are secure, that cannot be penetrated from the threats from the outside world. SPIEGEL: To protect their children, parents began to place their kids in adult-moderated activities, which says Chudacoff, has another benefit, especially to middle-class parents worried about achievement. They promise enrichment. Prof. CHUDACOFF: You know, karate classes and gymnastics, summer camps not only create safe environments for children but also give them enriched lives and ways to create self-esteem. SPIEGEL: So clearly, the way that most children spent their time has changed, and of course there have been other changes in the lives of kids, but a growing number of psychologists believe that these changes in how children play have led to changes in their cognitive and emotional development. Here’s some of the evidence. Back in the late 1940s, some psychological researchers did a series of tests on children. In one of the tests, they asked kids ages three, five and seven to stand perfectly still without moving. The three-year-olds couldn’t do this exercise at all, the five-year-olds could do it for about three minutes, and the seven-year-olds could stand pretty much as long as the researchers asked. In 2001, some researchers actually repeated this experiment. But as psychologist Elena Bodrova explains, the results were very different. Ms. ELENA BODROVA (National Institute for Early Education Research): Today’s five-year-olds were acting at the level of three-year-olds 60 years ago, and today’s seven-year-olds were barely approaching the level of a five-year-olds 60 years ago, so the results were very sad. SPIEGEL: Sad because the children were less able to do something called self-regulation. Self-regulation is the ability to control emotions and behavior. It’s a key component of a broader set of skills called executive function. Kids with good self-regulation aren’t impulsive, they have self-control, discipline, and this self-regulation is incredibly important. In fact, good self-regulation is a better predictor of success in school than a child’s IQ. Ms. LAURA BERK (Executive Function Researcher, Illinois State University): Self-regulation predicts effective development in virtually every domain. SPIEGEL: This is executive function researcher Laura Berk of Illinois State University. She says make-believe is a powerful tool for building self-regulation. That’s because during make-believe, children engage in what’s called private speech: they talk to themselves about what they are going to do and how they are going to do it, laying out the rules of play for themselves. Ms. BERK: We find that this self-regulating language is highest during make-believe play, and this type of self-regulating language, which we call private speech, has been shown in many studies to be predictive of executive functions. SPIEGEL: Basically, it’s through this private speech that children control and regulate themselves. In fact, private speech is how adults control and regulate themselves, too. Ms. BERK: If we look our own use of private speech, what we find is that we’re often using it to surmount obstacles, to master cognitive and social skills, and to manage our emotions. SPIEGEL: Unfortunately, the more structured the play, the more children’s private speech declines. Essentially what’s happening is that because children’s play is so focused on lessons and leagues, and because kids’ toys increasingly inhibit imaginative play, kids aren’t getting a chance to practice policing themselves. When they have that opportunity, the results are clear: Self-regulation improves. Ms. BERK: One index that researchers, including myself, have used to look at that is the extent to which a child, for example, cleans up independently after a free-choice period in preschool. We find that children who are most effective at complex make-believe play take on that responsibility with greater willingness and even will assist others in doing so without teacher prompting. SPIEGEL: Despite the evidence of the benefits of imaginative play, a number of child-development experts say free-choice play is in decline even in preschool. Here’s psychological researcher Dorothy Singer of Yale. Dr. DOROTHY SINGER (Psychological Researcher, Yale University): Because of the testing and the emphasis now that you have to really pass these tests, teachers are starting earlier and earlier to drill the kids in their basic fundamentals, so that play is viewed as unnecessary, a waste of time. I mean, I have so many articles that have documented the shortening of free play for children, where the teachers in these schools are using the time for cognitive skills. SPIEGEL: Singer and others argue that it’s not actually helpful to leave imaginative play behind. They say that all that wasted time is really not such waste after all. STEWART: That’s NPR’s Alix Spiegel with the most e-mailed story right now on npr.org. You can see a list of all of the most e-mailed stories you heard on today’s show npr.org/bryantpark. Find lots of fun activities for kids, with video instructions and printables. There’s a selection of craft ideas including gifts, games and easy kid-friendly cooking recipes. Check out the simple, safe and fun science experiments or very cool paper airplanes. Other categories inlcude cartooning, cheerleading, juggling, origami, jewlery, puppets, and more. Just follow along with the setp-by-step videos. The Khan Academy is a not-for-profit organization founded by Salman Khan with the mission of providing a high quality education to anyone, anywhere. It is currently a library of 1400+ videos on YouTube (and mirrored elsewhere) covering everything from basic arithmetic to advanced calculus, chemistry, economics and biology. The videos are supplemented by software that dynamically generates exercises and captures data on student usage and progress. Salman Khan received his MBA from Harvard Business School. He also holds a Masters in electrical engineering and computer science, a BS in electrical engineering and computer science, and a BS in mathematics from the Massachusetts Institute of Technology. The entire video library (it will blow you away!) can be accessed at The Khan’s Academy site. To keep abreast of new videos, subscribe to the Khan Academy channel on YouTube. Not just FREE (woo hoo!) but really excellent material, ma shaa Allah. I like using sites like Super Teacher Worksheets every once in a while. They are a big help when I am unprepared and also help keep Mars occupied when I have to spend more time on her sister. Super Teacher Worksheets provides lots of free (woo! hoo!) materials. There are Math, reading and writing, spelling, reading comprehension, grammar and phonics and also social studies printable worksheets. 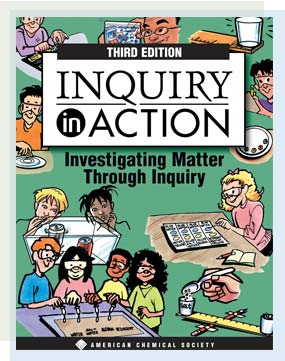 Inquiry In Action is a a 470-page resource of guided, inquiry-based activities that covers basic chemistry concepts along with the process of scientific investigation. It was developed and written by James Kessler and Patti Galvan from the office of K-8 Science at the American Chemical Society. Experienced educators both, Patti worked as an elementary school teacher with a keen interest in science education before coming to ACS. James has been developing resources for K-8 teachers for 20 years. Why am I going on about this book, you ask? It is FREE! I kid you not… all 470 pages (phew!) are available for download here.